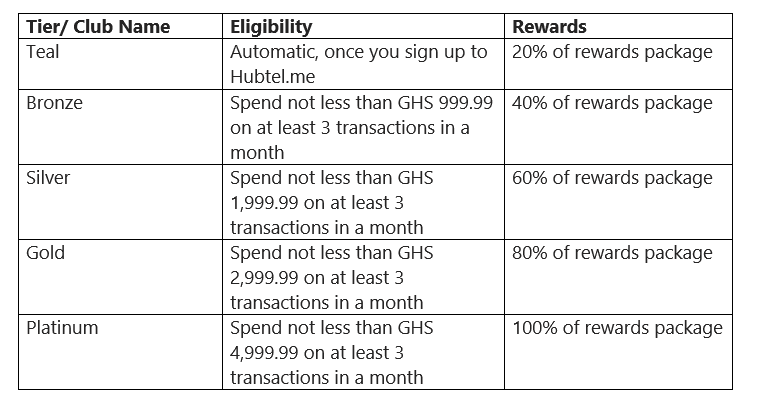 Hubtel.me rewards are simple; you get cashback loyalty reward points based on your club level and amount spent. The more transactions you perform the more you earn points and the higher you climb in club levels. These Tier Classes in ascending order are Teal, Bronze, Silver, Gold and Platinum. Rewards are calculated based on the amount you spend, your tier or club and the service you purchase. For instance, if you send 100 cedis via mobile money, you will get a different reward from when you buy airtime worth 100 cedis. There are rewards for every transaction except "Send Money" transactions below GHS 50.00 and when you pay for services with your Gratis wallet.